Modulated SPIRORAP® is an easy, quick, and effective way to insulate small bore pipes and fittings, pilot lines, by-pass lines and flexible connections. 1/2”, 3/4”, 1”, 1-1/4” tubing, pipes, threaded and welded valves, bends and elbows can be wrapped with this inexpensive, highly effective product. 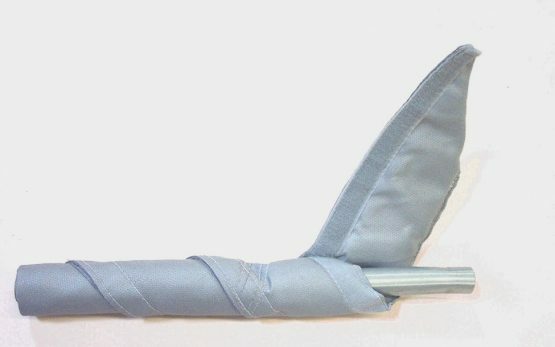 SPIRORAP® is manufactured in 4 inch wide by 5 ft., 10 ft., or 20 ft. length rolls with or without hook and loop fasteners. Every 18”, the SPIRORAP® is sewn with 2 rows of double stitches, 1/2” apart, creating modules. This simple but effective design allows for quick and easy custom sizing: cutting between the rows of stitches leaves a finished end and allows the wrap to be stopped where needed. Installation of Modulated SPIRORAP® is quick and easy. The strip is spiraled on itself creating a solid cover with overlapping spirals. 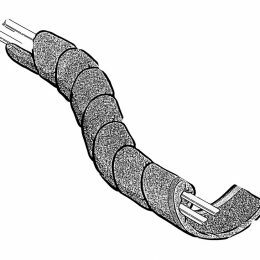 When the sewn-in hook and loop fasteners are used, every spiral is hooked onto the previous one, forming a closed cover. 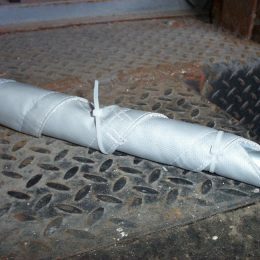 When no hook and loop fasteners are present, the spirals need to be fastened with standard electrical plastic ties which, when tightened, will hold the spirals together. SPIRORAP® comes with a specially designed starting point, allowing for complete coverage from the very beginning. The modules are designed and manufactured in a special fashion, giving the user a complete no-voids cover for the complete assembly. SPIRORAP® is the easiest, quickest and least expensive way to insulate small bore pipes, tubing, and fittings that are hard to insulate with other methods. SPIRORAP® easily goes around bends, elbows, unions, small hangers and flex connections. Available for temperatures up to 1000°F. To place an order, please call our main number at 630.595.5150. 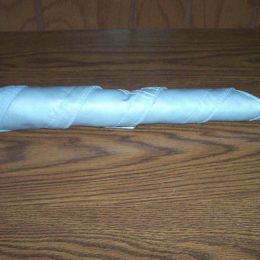 Advance Thermal Corp. designs and manufactures reusable and removable industrial insulation blankets, jackets and covers. Stay current with the latest insulation covers, blankets, and jackets. Every insulation product meets ISO standards and is reusable and removable.